Médecins Sans Frontières/Doctors Without Borders (MSF) the medical humanitarian organisation have been given permission to build the camp, work started on January 11th and it is expected to take four weeks to finish. 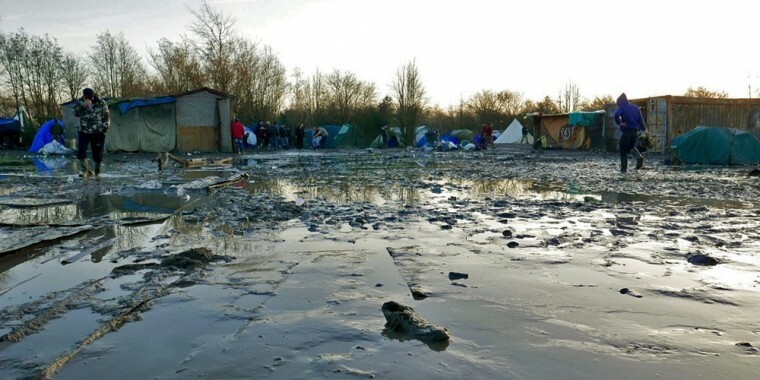 Vickie Hawkins, MSF UK executive director said: “Conditions in Grande Synthe are some of the worst that I have seen in 20 years of humanitarian work. “Hundreds of families from Iraqi Kurdistan, including many young children, are stranded in rivers of mud with just flimsy tents and blankets for protection from the cold. MSF’s medical teams have been working in Grande Synthe for the past six weeks and elsewhere in northern France for more than four months. The vastly improved site will include enough toilets, kitchens, showers and water points to ensure it meets the minimum humanitarian standards. Alongside that there will be electricity points, communal facilities, a warehouse and spaces for volunteer organisations. Vickie Hawkins follows on, saying: “Britain and France’s policies of deterrence are causing a humanitarian crisis, leaving people to suffer in terrible living conditions with serious implications for their health,” said Vickie Hawkins. “The new camp should be a temporary solution to bring those living conditions up to acceptable humanitarian standards – the kind of standards that are achieved in Jordan and Turkey, countries that are hosting many millions more displaced people than those in northern France. Next PostSecret Teacher 16th Jan 2016 – Why Must We Bow Down To Educationists? What’s the progress on this camp please, and what materials/equipment are still needed ?